The Dei Lucrii, spirits of wealth, were the Roman divinities that served as Mercury’s ancestors within early Roman belief. As the religio romana changed and evolved over time, Mercury became associated specifically with commerce and trade, particularly the corn trade. As a result, many merchants and tradesmen were devoted to Him, seeking his blessings and making offerings to him at his temple in the Circus Maximus. Later, as Greek religious ideas came to permeate Roman culture, Mercury was syncretized with the Greek god Hermes. By way of this Greek religious influence, the caduceus, winged hat, and winged sandals were attributed to Mercury. This influence was also responsible for expanding Mercury’s (recognized) jurisdiction to include animal husbandry, knowledge, travel, communication, the newly dead (as psychopomp), and divine heraldry, among others. When I first began to work with Mercury, laboring on an almost daily basis to understand him, the vast range and diversity of his influence are what struck me the most. That same quality is what I suspect made it so hard for me to “get” him in the very beginning. As I thought about him more and began meditating on him, it occurred to me that he is first and foremost a God of Exchange. Not exchange with a little ‘e’ but Exchange with a big ‘E’. His role in exchange is obvious as a god of trade and commerce, but his reach extends beyond that. To my thinking, Exchange is an unifying construct for understanding his specific areas of jurisdiction. For instance, as a god of animal husbandry, he facilitates an exchange between human beings and the animals and land that produce the stuff that sustains human life. As a god of heralds, he facilitates exchange between nations and other political entities. As a god of omens and divination, he facilitates exchange between humans and the gods. As a guide to the dead, he facilitates the exchange between the world of the living and the world of the dead. As a god of language and knowledge, he facilitates exchange between individual people and between cultures. This is the same exchange that he facilitates as a god of travel, roads, and hospitality. Mercurius was also understood as a god of skill in general. I understand skills as tools that help us to reach some goal or end or to facilitate a process. It makes perfect sense to me that a God of Exchange might need to be skilled at many things! Related to Mercury’s role as a God of Exchange, he is associated with boundaries – both their maintenance and the crossing of them. To my understanding, it is in this capacity that he serves as a god of thieves and trickery. Like with most gods, he can bring favor or wrath; he can ward against thieves and grant the intellectual prowess that defends against trickery or he can admit thieves to your property and encourage a dullness of mind that would render one vulnerable to a wily trickster. Interestingly, during the growth of the Roman empire, Mercury also became syncretized, via “Interpretatio Romana”, with a number of other deities including Odin and Wodan among the Germanic peoples and Lugus and Lugh among the Celts, and many others. 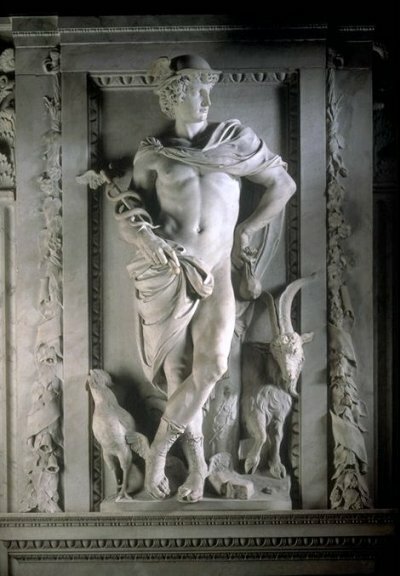 I think that Mercury’s tendency to be on the front lines of cross-cultural connections also fits with his role as a God of Exchange. It is noteworthy that, from my survey of the scholarly and literary sources, no other Roman god seems to have been so quickly and so easily absorbed by so many diverse nations, which the Romans connected with (via trade) or invaded (via military force). “Gaulish” Mercury comes to mind as an example. When I think of Mercury, I think of him as the drive toward connection and exchange that lies at the heart of everyday life. We have interpersonal, political, social, religious, economic, and a host of other exchanges and interactions every single day of our lives. His sphere of influence is clearest to me in the morning when I cross a major street in my city to catch the bus to my university’s campus. As I stand waiting for the bus, waiting for the business of my day to begin, I often look up into the trees and observe the wind rustling the high leaves and branches. I always think of it as the breath of Mercurius inspiring the connections, interactions, and exchanges of the day to commence. The above are my personal thoughts. I have synthesized my own experiences with what I have read about Mercury over the years. Below is a listing of most of my sources. As a long time devotee of Mercury I was thrilled to stumble across this. I’m always interested in learning more about my favorite god and meeting new followers. As stated we are few and far between. I think it’s because some find him intimidating. I find him intriguing. Hi Raven! It’s wonderful to meet you :D. Mercury was one of the first gods to approach me, and it’s been a wild ride. I too find him very intriguing! Mercury in India is known as Budha Graha, We are aware of Mercury since 10000years. His gemstone is green sapphire. If you wear green sapphire you will get positive benefits from mercury. Thank you so much for writing this! I’m just starting to get to know Mercury on a personal basis. Much of the information I’ve encountered online is intertwined with Hermes, but I get the feeling that they are not the same, and it might be rude to approach Mercury as if he were Hermes. I would love to have a look at your full list so that I can educate myself further. Jennifer, hi! I am glad that you found this information on Mercury to be of use. I will create the full citation list and get back to you soon. I don’t have it on hand but can easily construct it. Take care! Thanks! I look forward to reading more. Full moon blessings! Thank you. Mercury has been important to me ever since I can remember. I recently met him again last night. I wanted to deliver a psychic message to some one and in my meditation I saw a healthy energetic winged young man on a mission. He did not wast any time. He took my message and was off in an instant. I believed that he completed his mission as soon as he exited my meditation. WOW ENERGY PLUS!!! Always a pleasure to find another devotee of Mercury!! We seem rare at worst, elusive at best. I love this post. As a fellow devotee of Mercury I appreciate your use of the idea of Exchange. That makes perfect sense to me. You get a lot bonus points for mentioning the Dei Lucrii! Happy to have found the blog! Thanks, Beth! I am so glad to hear from another Mercury devotee! I hope that we have more opportunities to engage in exchange regarding Mercury! Please pardon all the exclamation points; I’m just so excited!